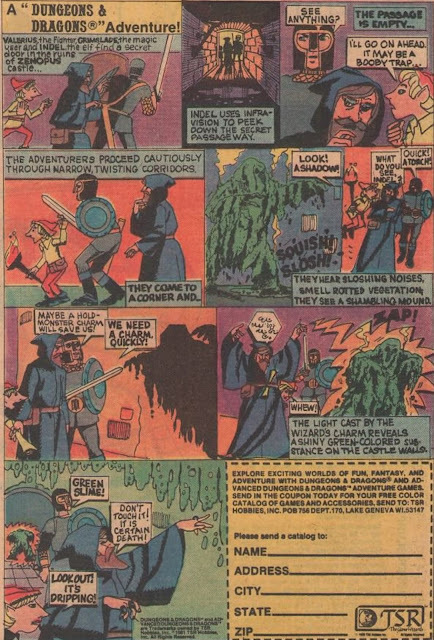 That’s not merely a good riff in Mystery Science Theater 3000’s take-down of Manos the Hands of Fate. It’s a fact of human existence. We don’t fear what we know. And as fallible, mortal humans limited by our own field of vision and our own biases, we don’t always get answers to life’s greatest mysteries. Or even its tiniest ones. Sometimes, we must go on living with the knowledge that life is ambiguous. Of course, man invented religion to make the scary ambiguities of existence tolerable. If we there is a God -- diving, loving, and good, watching over us at all times -- we don’t have to fear the things we don’t easily understand. But the best horror movies are invariably those that tread fully into life’s ambiguities. This is why The Blair Witch Project (1999) is an authentic masterpiece. Many questions about the film’s narrative are left unanswered. Is there really a witch? Is she the reason why the filmmakers are hopelessly lost in the woods? What happens -- really -- to Heather, Josh, and Mike in that creepy house? Who murders them? The witch? Or a human being? We see things happen on camera, and yet exactly why they happen is left purposefully unexplored. By contrast, Paranormal Activity (2007) destroys all sense of ambiguity in its final act as a demon gets its close-up, front-and-center, on camera, satisfying the human psychological need to “see” the monster, and in the process, understand everything. My point, I suppose is that ambiguity is real, and it is scary, and therefore it of good use to horror films. More to the point, the way that horror movies often express ambiguity is by diagramming two possibilities at the same time, and never really settling on an answer. Instead, we get competing theories. And in a really good horror film of this type, both theories track, and don’t negate each other. That’s the kind of movie Hollow (2012). This impressive and scary found footage movie treads deeply into ambiguity, and its story of horrific happenings can be interpreted in two very different ways. Either this film is the story of a depressed, psychologically-disturbed young man who, after losing the girl of his dreams to another man, finally snaps and descends to bloody violence. Or, this is the story of a regional curse in Suffolk, of a gnarled old tree that causes lovers to mysteriously commit suicide. Afterwards their corpses are found hanging by first light. It is to Hollow’s ever-lasting and artistic credit that the film succeeds in telling both stories simultaneously, leaving the audience to slow boil in a frightening, and unending stew of authentic ambiguity. Hollow remembers that human beings not only don’t always get the answers they desire. Sometimes they get no real answers whatsoever. Scott (Matt Stokoe) and Emma (Emma Plumtree) are planning to get married. They decide to take a weekend trip to Suffolk, to the home of Emma’s recently-deceased grandfather, a vicar at the local church. Along for the trip are Emma’s best friend, James (Scott Stockman), and his current girlfriend, Lynn (Jessica Ellerby). But the truth is that James is hopelessly in love with Emma, and convinced that on this weekend he can expose Scott for the player he is, and win her love. He intends to manipulate Lynn too. On the way to the dead vicar’s house, the young adults accidentally hit a fox in the road. It disappears after being injured, and Emma realizes they have stopped in close proximity to a haunted tree that is famous in the area. In particular, the tree reportedly causes lovers to commit suicide. Worse, Emma’s mother has often told her stories of a creepy experience with the tree in her childhood. As the weekend continues, Emma finds the vicar’s files about a series of suicides nearby; of lovers found hanging from the branches of the tree...necks broken. Meanwhile, the youngsters party, abusing alcohol and drugs. While stoned -- and after touching the tree -- Scott makes a pass at Lynn, effectively ending his engagement to Emma. But that doesn’t mean Emma is going to be with James, either, and he simply can’t take the rejection. By night, James disappears into the woods, and the others follow him, only to encounter violence and terror. When you get down to it, every aspect of the narrative in Hollow can be explained in one of two ways. Either the young adults self-destruct, after consuming copious amounts of alcohol and drugs, and ultimately kill one another, or -- in the tradition of the urban legend of region -- they are felled by the cursed tree. This is her way of describing the impact of the haunted tree upon her friends, and on her too. But if you think it about, “whatever we take in there” might also refer to the drugs/alcohol that are consumed. Drugs can also twist up the emotions inside people, and reveal hidden qualities or facets of a personality. Certainly, you can ask yourself which option is more plausible: that relentless partying releases sexual inhibitions in twenty-somethings, or that proximity to a cursed tree accomplishes the same task. 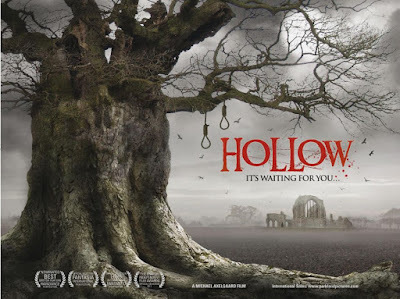 But since this is a horror film, we can suspend disbelief, and Hollow doesn’t choose a path for us. We must countenance both ideas. Similarly, the film’s boogeyman -- either the specter from the tree, or a psychologically-disturbed James -- wears James’ slicker. And when this “force” attacks, we never actually see the blows. Instead, the film simply reveals people yanked out of frame. Importantly, that yanking could be done by a violent supernatural force, or just a very murderous rejected boyfriend. Scott’s disappearance, while looking under the hood of the car, especially supports this reading. He is holding the camera when he is attacked. It just drops to the ground, so viewers have no idea what, precisely, has grabbed him and pulled him away. It could be anything. supernatural or human. I know where I come down on the parallel paths proposed by Hollow. 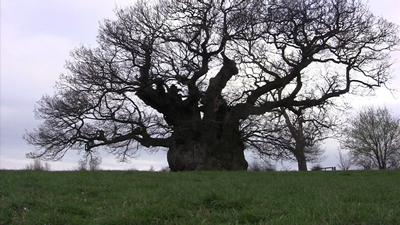 The last scenes of the film reveal all the youngsters hanging by their necks from branches of the old tree. But only one of their bodies is still twitching. That body belongs to James, not the last victim, Emma. Therefore, my guess is that mad with jealousy and grief he killed the others, and then, in the last instance, hanged himself. Of course, maybe the (devil) tree made him do it. It takes a high degree of patience, discipline and precision to craft a film that walks a fine line between two equally supported possibilities, and Hollow works because that line is never violated or disrespected. Ultimately, this is a found-footage film that can be read in the way the audience chooses to read it, but no clear or definitive answers are provided. All we can say for certain is that four young people die at that tree, and that the tree has been the site of suicides before. If Hollow boasts any drawback or deficit, artistically-speaking, it is that some of the final scenes, set inside a car parked under the tree, go on far too long. We know a negative, sinister force -- either human or not -- is nearby, and so the camera seems to endlessly pan around the gray, unattractive car interior. A full five minutes or so could be trimmed here, and the movie would lose none of its visceral or cerebral impact. Other than that scene, Hollow is diligent, smart, and on-target. One terrifying scene, involving a cliff, a drop-off to the beach, and a “floating apparition” (that also has another, more earthbound explanation), is genuinely pulse-quickening. Another sequence, with Emma walking on a lonely road alone at night, and hearing noises -- her vision limited by the range of the camera light -- is also tension-provoking. All the tropes of the found-footage horror film are here in Hollow, to be sure. There’s the driving sequence/car accident scene (Exists), the character engagement announcement (Extraterrestrial), the creepy artwork (see: The Taking of Deborah Logan), and so forth, yet Hollow innovates where it counts. This film from director Michael Axelgaard sets out to tell two stories in one, and ramps up that all-important quality of ambiguity. It's really amazing to consider, but in a genre format explictly about "seeing," Hollow never tips its hand, never reveals exactly what kind of force is working its dark purpose. Great review on this one. We watched it earlier this year and it was pretty darn creepy. Some really good dread created with this one.